The Cassian & K-2SO one shot shows how the Rogue One stars met, but it’s nothing earth shattering. With an okay story, and average artwork, it doesn’t really excel at anything. The dialog is pretty decent, but there’s not alot to make this one anything but skippable. In this story, Cassian teams up with a pair of alien Rebel operatives named Kertas and Rismor. They communicate by scent, so they don’t say much. There specialty is rooting out Imperial tech. They go to the planet Wecacoe in hopes of finding some useful information hidden in an Imperial cruiser, but instead find an Imperial security droid. The droid, of course, is K-2SO. Cassian tries to hack him with mixed results, and the foursome works their way past Imperial stormtroopers as they try to escape. In the end, Cassian manages to wipe out the dangerous part of K-2’s programming, and Kertas and Rismor help him and K-2 escape. First off, the art is this issue is not very impressive. At times it can look very simple or a little sloppy. However, they do manager to do a pretty good job with all of the non living elements in the story (ships, buildings, etc). They also do a pretty good job with Cassian’s expressions. One of the things I didn’t understand, however, is why Kertas and Rismor spend their time starring at a wall instead of hacking into the Imperial cruiser. In the end, the art gets the job done by presenting a story in pictures, but it’s nothing that’ll make you wish this art team comes back to do more issues. The story isn’t much better. It’s kind of odd how they come to this planet to hack an Imperial cruiser, which would be rare and worth the trip, and they just end up with an Imperial security droid that they could have nabbed anywhere. It devalues Cassian and K-2’s relationship a little since it really was special in anyway. Cassian didn’t go there to get a droid, he just got lucky the droid he wound up with would suffice for his whole Imperial intel mission. On the plus side, the dialog was pretty good. Cassian does most of the talking and I felt that Swierczynski managed to capture him with a bit of humor thrown in at every turn. Perhaps too much, but it did add some levity to the story. K-2’s dialog wasn’t too bad, but Cassian was definitely the standout. 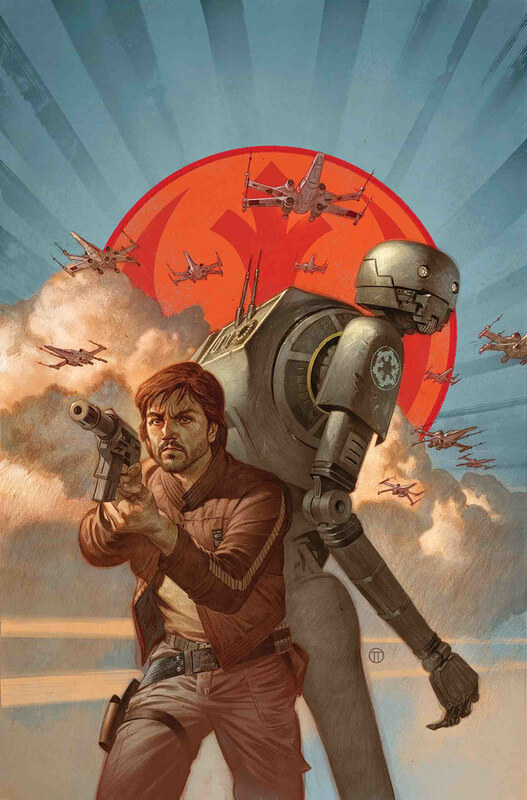 With okay artwork and an okay story, there’s nothing exceptional about Cassian & K-2SO #1. If Marvel does plan to tell more stories, I’d be more inclined to a new creative team. As is, I give this one two out of five metal bikinis.